Solutions > Asset Productivity Consulting Services > Resources > 5S Gone Wild…how far is too far? You can’t get too much of a good thing. However, taking the 5S methodology to the highest level possible might be an exception. The 5Ss (Sort, Simplify, Shine, Standardize and Sustain) are the basis for creating a workspace of visual management and lean operation. 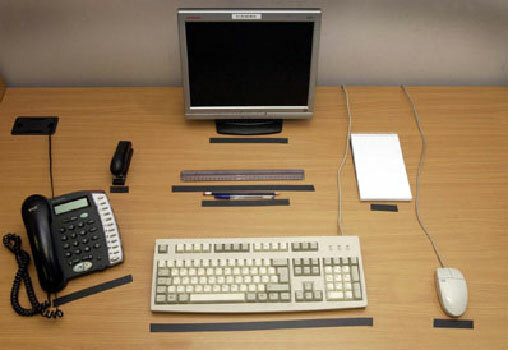 When attempting to implement a Visual Management system, most companies accomplish the painful sorting to identify and dispose of obsolete or unneeded items, organizing the needed items into some type of a defined order, and scrubbing the workspace until it shines. The last two steps in the process become the challenge: how to maintain the standards on a daily basis and the discipline to sustain the transformation long term. It can be very difficult to implement a comprehensive 5S program and effectively communicate the methodology the employees will need to support the process. Training and implementation of a 5S visual management program usually requires about 40 hours per employee the first year. The second year, the program expectations become a part of the employee’s job performance and can be tracked using personal key performance indicators. Kaizen events are the most effective tool for establishing a 5S continuous improvement environment of change and they allow many small successes to translate into overall business improvement. Kaizen is an activity that identifies and provides a plan to reduce waste through revised business operation. Common areas of excessive waste in a manufacturing facility are in the Maintenance, Repair and Operational (MRO) inventory, workflow processes, quality and overall equipment utilization. The payoff for a successful 5S program is better utilization of the workforce, allowing workers to perform more value-added activities, which translate into increased profits, greater equipment utilization and promote a safer work environment. The best opportunity for waste elimination in the MRO inventory comes in the form of obsolete parts that are not associated with an equipment asset. These parts commonly account for 20 to 30 % of the total inventory value and it costs thousands of dollars in carrying cost to maintain these items each year. Waste in the daily business operation comes in the form of uncontrolled processes and process hand-offs from one department to the next, leading to non-value- added steps that create costly waste. Identifying and eliminating waste in these areas of the business will result in increased profits, higher worker morale, higher equipment and worker utilization. A comprehensive 5S Visual Management program provides a structured approach to continuous improvement using small, sustainable steps to improve business operation and increase profitability. The difference between ordinary and extraordinary companies is the discipline to continuously work to eliminate waste in their business. It is important to note that 5S, like any other improvement methodology, can be misused. Let’s consider, for instance, the office cubicle that has a tape outline of the phone, the laptop and even the stapler. Now ask yourself, how does this improve the efficiency of the worker? Has 5S created a standard that, if deviated from, will increase the cost of operating? Some may argue that orderliness is next to godliness and a cluttered desk leads to a cluttered mind, but proper application of 5S means organizing your workspace to more efficiently support your business process (daily routine). Lord knows it's easy to make fun of this effort to apply 5S principles to the office. If there's one way to alienate and demean people, it's to tell them where to put their stapler. The proper office 5S implementation might identify the “Inbox” and “Outbox” for more efficient processing of purchase orders. Or you might establish a work routine that outlines the timeframes for checking and responding to emails in order to further prioritize your daily activities and prevent email from consuming your agenda. 5S, when applied as a performance improvement methodology, can greatly improve your bottom line with improved profitability, efficiency, service and safety. The results are visually dramatic and also increase pride and morale. Getting your organization to use 5S appropriately in order to sustain workplace efficiency requires ongoing management commitment to train and reinforce standards established via formalized and frequent audits. Training helps assure that everyone in your organization has the same baseline understanding of the 5S process. 5S should be more than just housekeeping.When properly implemented, 5S is part of the total Lean manufacturing strategy. Wally Wilson CMRP, CPIM, is a Senior Subject Matter Expert in Materials Management and Work Management Planning & Scheduling with Life Cycle Engineering. Wally has more than 30 years of experience in plant management with three Fortune 500 corporations and has helped both domestic and international clients realize multi-million-dollar savings through lean inventory-management practices and MRO supply-chain optimization. You can contact him at wwilson@LCE.com.